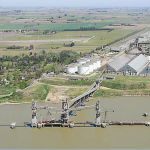 Owned by SACEIF Louis Dreyfus this terminal has 2 berths: north berth for grain and by-products, and south berth for vegoil only. 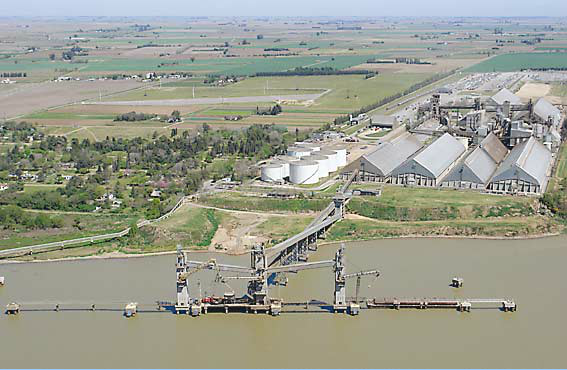 The grain (north) berth, of reinforced concrete, is in relatively deep water 250 m offshore, with an inclined loading conveyor belt and a viaduct of steel lattice work on concrete pilings connecting it to the terminal. This berth consists of four dolphins, overall length 140 m with two outlying mooring dolphins 75 m ahead and astern. Cape size vessels have berthed. The loading gallery is supported by three vertical towers stepped alongside the dolphins and to which 3 loading arms are attached. The loading arms, which are lowered/swung out over the vessel have 25 m outreach and are fitted with adjustable vertical chutes at their ends, which in turn are fitted with rotating spoons making these units multi-directional. Loading is from two belts at average 2800 TPH for grain or 1500 TPH for by products. The berth is fitted with a 12´´ vegoil pipeline giving loadrate 1000 TPH. 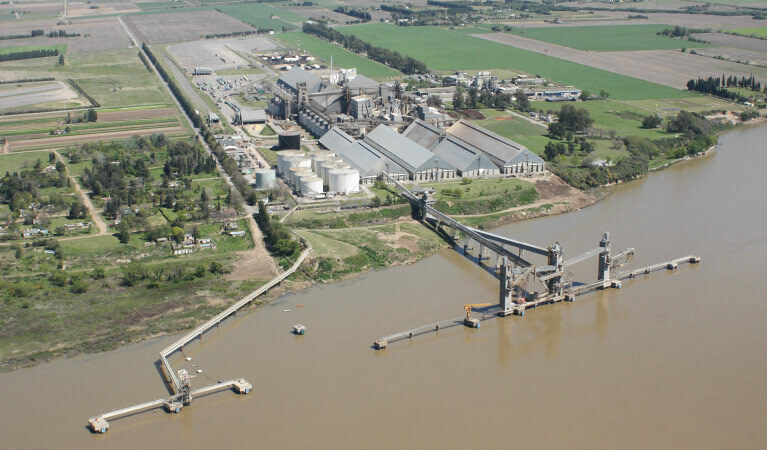 Grain storage at the plant is 1.100.000 tons, oil 91.000 tons, with ample capacity for reception of railway wagons and trucks. Depth alongside the berth is reportedly 12/20 m (39/65ft) North/South ends at datum and clearance at datum 24 m. Fresh water available from private firms. Bunkers by barge only. The bio-diesel and vegoil berth, about 250 m south, made of reinforced concrete consists of three dolphins, giving a total frontage of 100 m, with two outlying mooring dolphins, for vessels LOA 270 m; depth alongside 20 m (65´) at datum ; 2×12″ pipelines, gives a load rate 800 cbm/h. 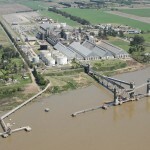 Annual export capacity for both grain biodiesel and vegoil, abt. 8 million tons.